Now this is a beautiful instrument -- almost too beautiful to play. It should come with its own glass-case, halogen spotlight and velvet rope. 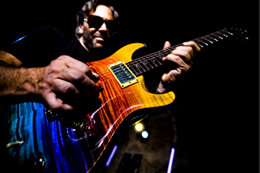 Al DiMeola has been playing various PRS's since the late '80s, alternating them with his mainstay axe, his famous black '59 Les Paul Standard with cream DiMarzio pickups. But this is the first time PRS has come out with an 'Al D' signature axe. The standard tremelo bridge and pickup covers for the humbuckers are nickel-plated. The pickup covers, interestingly, have a brushed texture giving a satin-matt finish. And as anyone who has owned a guitar with nickel hardware will tell you, nickel ages to a similar dull lustre if not wiped regularly. A 3-way toggle switch, and a single volume and push/pull tone control for humbucker/coil-tap selection complete the setup. Al originally suggested a 'tie-dye' finish which eventually evolved into the breath-taking Prism of colors on the final version. And if you look closely at the Prism's various tints, several of PRS's primary colors are represented -- Vintage Yellow, Amber, Vintage Cherry, Purple, Royal Blue, Whale Blue and Emerald Green -- each blending into the next. Wow.